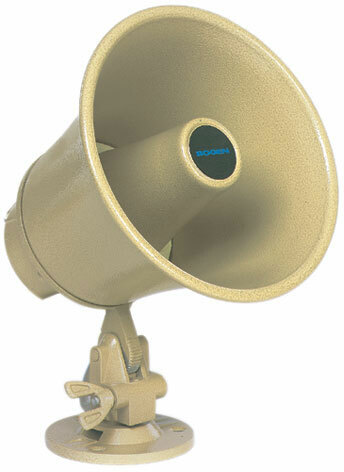 The double reentrant, horn-type loudspeaker from Bogen, IH8A Loudspeaker, with its high intelligibility and efficiency, is designed for paging applications. Its all-metal, textured, mocha, weatherproof construction makes it equally well suited for indoor and outdoor applications. A detachable mounting bracket provides precise positioning of the horn in the vertical and horizontal planes. A 12" connecting cable is also supplied for easy installation.